How to draw hair for realistic portrait. How to draw hair for realistic portrait. How to draw, shade and render hair along with realistic face traditional portrait way. Draw and shade hair with pencil sketch. Drawing and shading hair on portrait of a woman girl female using pencil. Quick video lesson on how to shade and define values on your hair drawing sketch easy to follow and understand video and step by step lesson. Learn from Step by step and video tutorial. Hair seems like a very complicate subject. There are so so many request via facebook, email, etc. for me to do hair drawing tutorial. Finally, here it is. First, like I said so many time, simplicity is the key to painting or drawing. Same here, when you take a look at a person's hair, you mind tell you to think hair as a complex subject. Though, if you really take a look and try to simplify it into shape and form by trust your eyes to see it for only light and shadow. The tips is to squint, like in painting, to blur things out. It is easier to see the simplify form of hair when squint. A lot of you might not get squinting in the beginning, it took me many time to actually squint to see simple form of the subject I am drawing or painting. This is a very simple and easy to follow tutorial of how to draw hair, I would not know how to explain it any easier than this. Here is the final sketch of drawing hair tutorial. 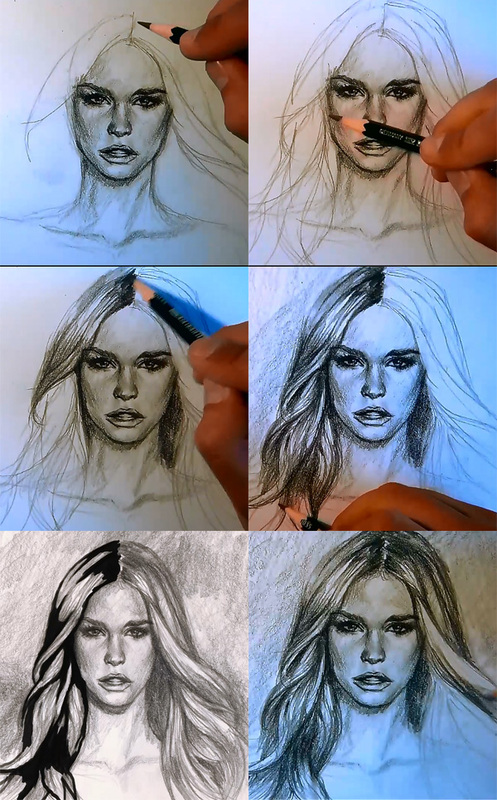 Below is a video tutorial how to draw hair for realistic portrait. Below are step by step images of how to draw hair. Also you might be interested in How to draw female face and how to draw different looking portraits tips and technique. If you like drawing comics charcter like X-men, Batman, Superman then you should go see the drawing tutorials from the following links How to draw comics girl Emma Frost, How to draw comics Batgirl, How to draw Fantastic 4 Susan Storm (basic comics style drawing with pose) and watch How to draw comics superhero spiderman, and my How to draw comics character Hulk, it also has coloring or paint over tutorial. Also the new arrival video tutorial, How to draw Captain America. And an older video tut, How to draw Batman or Darknight. These are somewhat a little in between basic and intermediate and you should have some drawing experience.